Spa cosmetics for the lover of healthy skin products made with natural ingredients, Sea of Spa brings this shower gel scented with lavender blossoms to you. Give your body the gift of a great cleansing lather enriched with skin-nourishing Dead Sea minerals. Rest well tonight! 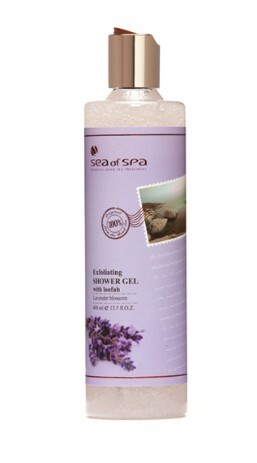 Sea of Spa’s Lavender shower gel is one of a well-known line of Dead Sea cosmetics. Since Roman times, people have gathered at the shore of the sea to cover themselves with mud and enjoy the benefits that Dead Sea minerals have to offer. Sea of Spa brings those minerals into your home, minus the mud, of course. This shower gel is enriched with the essence of lavender. Lavender is an herb that is often used to remedy many common ailments. In today's world, the healing powers of lavender are even more vital. Have you ever lain awake at night staring at the ceiling, wondering when the sandman will finally get around to visiting you? Try some lavender shower gel befor you go to sleep, and let the essential oils relax you. Feel stressed at work? Try waking up with a shower and Sea of Spa’s decadent Lavender shower gel. Lavender is noted for it’s unique, stress relieving aroma. In short, this shower gel is a great fit for the stresses of a busy life. Aqua, Sodium Laureth Sulfate, Glycerin, Cocamidopropyl Betaine, Polyethylene, Propylene Glycol, Polysorbate-20, Parfum, Acrylates/C10-30 Alkyl Acrylate Crosspolymer, Triethanolamine, Imidazolidinyl Urea, Luffa Cylindrica Fruit Powder, EDTA, Benzyl Alcohol, Maris Sal (Dead Sea Mineral Salt), Dunaliella Salina Extract, Olea Europaea (Olive) Leaf Extract, Daucus Carota Extract, Punica Granatum (Pomegranate) Bark Extract, Methylisothiazolinone, Methylchloroisothiazolinone. May contain: Alphaisomethyl Ionone, Amyl Cinnamal, Benzyl Benzoate, Benzyl Salicylate, Butylphenyl Methylpropional, Citronellol, Coumarin, Geraniol, Hexyl Cinnamal, Hydroxycitronellal, Hydroxyisohexyl 3-Cyclohexene Carboxaldehyde, Isoeugenol, Limonene, Linalool, Red 40, Blue 1, Yellow 5.